The Division of University Outreach and Engagement connects Oregon State University to the rest of the world by making its educational programs accessible wherever and whenever people need to learn. 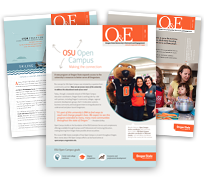 The division provides leadership for the outreach and engagement mission and includes the OSU Extension Service, Extended Campus and Professional and Continuing Education. The stories included on this site represent a sample of the outreach and engagement work that is happening across the university, the state and the globe with our many community partners. If you have questions, comments or suggestions for future stories, please contact Rebecca Badger at rebecca.badger@oregonstate.edu.